The Olympus Pen E-P5 - the fourth-gen Olympus Pen digital compact camera keeps the retro styling, but what else does it bring to the table? Do you like your camera tech with a splash of retro chic? Then you're probably already aware of the Olympus Pen range, of which the Olympus E-P5 is the fourth iteration of a digital compact camera series that began with 2009's E-P1, promising digital SLR quality in a more portable form. And in fact its stylistic origins date back even further to a 50-year-old film camera range that took the Pen name because it was claimed to be as easy to carry with you as said instrument. A slight exaggeration perhaps, but we get the idea. Naturally the interchangeable lens Olympus has witnessed growing competition these past four years, most strongly from compact system cameras (CSCs) such as the Fujifilm X20 and the Fujifilm X100S, and to a lesser extent the classically styled Pentax Q series. For those who favour a more modern take, further rivals are to be found in the Sony NEX-6, Samsung NX300 and Panasonic Lumix G6 ranges. In response Olympus has, if anything, gone even more old school. 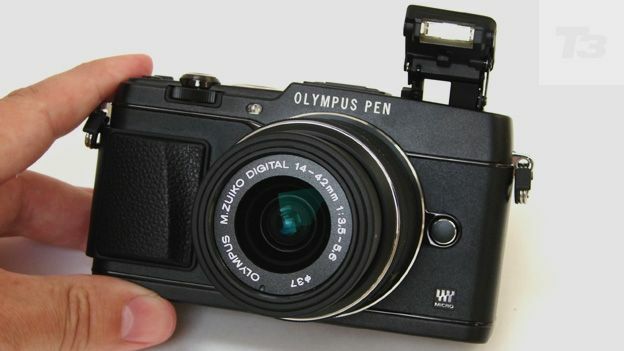 The metal constructed E-P5 is the first of its digital era cameras to mirror the 1960's Pen F by actually having 'Olympus Pen' engraved on the fascia. It's available in silver and black, entirely black, or white body choices. The Olympus digital Pen series was the one that arguably started the boom in CSCs so it matters less than it might that a good two years have elapsed since the Olympus E-P3 was launched - and that we've seen a quite a few great alternatives since. Of course, it also helps that the new E-P5 has the same 16 megapixel 4/3 inch CMOS sensor as the £1,000 Olympus OM-D E-M5, while this is the first of the manufacturer's cameras to offer built-in Wi-Fi, one of the current must-haves first introduced by Samsung and Sony with their own models. The idea is that not only can pictures be shared with your smartphone; it can remotely control the camera's focus and shutter release too. Another advantage of the Olympus CSC range is built-in image stabilisation; here its five axis system also mirrors the OM-D's anti shake capabilities. While the above sounds enticing enough, the price alone does single out the E-P5 as an enthusiast tool, however. It's a recommended £899.99 body only, £999.99 including the regular 14-42mm kit lens (a match for a 28-84mm focal range on a 35mm camera) as we've played with here. Alternatively, it's £1349.99 for what should prove the true enthusiasts' favourite option of a 17mm f/1.8 prime lens plus a VF-4 high resolution viewfinder for eye-level shooting that clips onto the camera top. Just to push the boat out completely, if choosing this last premium option, purchasers can request the fitting of a real wood handgrip at the time of ordering. The Olympus E-P5 both visually and practically suggests itself as an alternative to that DSLR by including front and back command wheels for scrolling through functions and menu choices - just like on an actual DSLR. Thankfully, its maker has kept the articulated pop-up flash sunk into its top plate introduced in the previous iteration in the E-P3. Whereas the previous generation allowed you to unscrew or re-attach the handgrip at will, however - allowing the user to make the camera even more compact, - this version has the grip resolutely fixed. Its predecessor's grip was easy to misplace once unscrewed, so we don't have strong feelings either way about this alteration. As it is, the narrow grip provided does make for a reasonably steady hold, even if shooting one-handed. A new step down top plate design, which means the flash and hotshoe sit on a higher level, while the shooting mode dial, shutter release button and on/off switch are located on a lower one, has resulted in a couple of control changes. A nine-option mode wheel is neatly level with the top plate, its ridged edge jutting out marginally at the back enabling it to be spun by the thumb. Powering the camera up or down is now controlled via a retro-styled lever rather than an actual button. It's not all harking back to an earlier era, however, as we also get an instant video record button next to the thumb grip, beneath which is a second button with a magnifying glass icon for enlarging portions of the image to check fidelity of focus in playback. The remaining buttons are also self-explanatory if rather too tiny for our liking, being for menu, info, delete and playback. Additionally the backplate features a familiar four-way control pad with exposure (+/-3EV), comprehensive flash, continuous shooting or self-timer options. It's worth noting that the compact 14-42mm zoom provided with the camera, as with previous generations of Olympus Pen kits, features a locking mechanism via which the lens is either retracted to its most compact state, or fully unfurled. The lens needs to be manually extended before the camera will function properly. An on-screen text warning prompts you to do this on power up, which means that it isn't quite as quick off the blocks as a DSLR between powering up and you being able to take the first shot, or video, even if it is a damn sight more portable. However, once up and running the E-P5 is fast, focus locking on target in the blink of an eye. Despite priding itself on a half remembered heritage, this premium Olympus Pen hasn't completely eschewed any hint of modernity. Thus the E-P5 comes with a very useful articulated back screen that, as on Sony's NEX range, can be tilted up or down for shot composition, though - again like its rival - it cannot be flipped out to one side nor twisted to face the subject. Touch panel operation is also offered - though you wouldn't realise at first because of the plethora of hard keys alongside. The screen resolution is, however, very impressive indeed and this generation offers a sizeable jump from the 610K dot resolution of the earlier E-P3. Indeed the E-P5 now trumps most in its class with a whopping 1,037,000 dots. The screen resolution hike is welcome in lieu of any alternative viewfinder being included. However, there is the option to spend extra on optical or electronic versions that attach via the top plate hotshoe, or go for the most expensive E-P5 bundle option that includes the very latest electronic viewfinder. Not only is the image relayed by the screen for lining up a shot incredibly smooth and life-like, even as you pan with the camera, but video looks stunning and sounds good too - thanks to built-in stereo microphones. The fact that it is a touch screen also lets the user scroll through photos and video clips with a flick of the finger, though a pinch and a flick won't enlarge the shot as you might expect on a smartphone - there's a hard key provided for the purpose. You can, however, drag the focus point around the screen with a fingertip if so wished, in order to specify one particular area of interest, or fire off a shot with a finger tap. Largely a 'best of both worlds' approach then. The E-P5 comes with a BLN-1 lithium ion rechargeable battery. Olympus claims that this is good for 400 shots from a full charge, which sounds impressive until you hear the caveat that performance drops by 50% if you're using the cameraís rear LCD in Live View mode to compose shots - pretty unavoidable really, unless investing in an optical viewfinder. Typically the best of its rivals will offer around 260 to 300 shots. This being an Olympus camera, we get the option of selecting a host of digital filter effects to have applied to the image at the point of capture, which are always fun and effective, particularly if shooting in dull conditions and not wanting to have the faff of otherwise trying to lift the appearance of the shot in Photoshop later. This does, however, slow the writing time, inevitably. Image wise we didn't notice much of an improvement or otherwise over previous generations of Olympus Pen cameras - the sensor size has after all remained the same. At its worst some shots can appear little better than the output of a good snapshot camera - with the occasional bit of over-exposure, pixel fringing and blown highlights in brighter conditions. A fixed focal length lens may naturally be sharper when twinned with the E-P5 than the jack of all trades 14-14mm provided as well, and you'll be able to achieve more DSLR-like shallow depth of field shots than the maximum f/3.5 aperture of the kit lens on test will allow too. If not exactly knock out, at least a pleasing amount of detail is provided under the circumstances, which makes the E-P5 suited to general purpose use. However, we can't help but feel the Canon EOS M, plus Sony NEX and Samsung NX ranges with their digital SLR sized APS-C sized sensors still have the edge for picture quality. Video is more forgiving and here the E-P5 particularly cuts the mustard, with clips looking great when replayed on the camera's own high-resolution screen and almost as good when viewed full size on a desktop monitor. The stereo sound is a further bonus, as is the camera's swift and silent adjustment of auto focus (AF), when twinned with its kit zoom for shooting video clips. In many ways the 16.1 effective megapixel Olympus E-P5 is only marginally less expensive version of the OM-D E-M5 for those photographers who want a premium compact system camera but either prefer a tilting LCD to the built-in viewfinder omitted here, aren't fussed about the latter's omission, or are happy to spend extra on an EVF that clips onto the E-P5's vacant hotshoe (or the kit that includes it). The real stumbling block for us, however, is the asking price on launch, though this is sure to drop in time. It feels like we're paying a premium for the classic looks and solid build. The less flashy E-PL5 or E-PM2, which sit below it in the current Pen range, also share the OM-D's sensor and offer 16.1 effective megapixels; in doing so arguably offering better value. We had the all-black E-P5 in to look at - but go for the black and silver option for the full retro-tastic effect. Despite being a compact system camera the E-P5 is not a pocket camera, either. But then, when it looks this good - and provided you can justify the outlay - why would you want to do anything other than attach the provided shoulder strap and show it off?